A project manager — call him George — once asked me about guiding a team in making tough decisions. Senior management had informed George that they had rejected his team's recommendation, opting instead for an idea the team felt was unworkable. George couldn't convince the managers of their error, and they'd told him to "Make it so." Fearing the team would go ballistic if he told them the news, and not wanting to command them, George told the team the issue was still open, and asked them to rethink it, hoping to nudge the discussion in the "right" direction. A horse. Note how the eye is positioned. The visual field of a horse is very different from ours. We're blind to our rear and side. By contrast, the horse can see almost all around, except for two small blind spots, one to the front and one to the rear. This ability might be the reason why horses have difficulty in urban traffic — they see everything, and it must be very nerve-wracking. To "protect" them, we put blinders on them. When we feel the need to put blinders on other people — to curtail some of their Five Freedoms — we're essentially conceding that people have abilities for which our management skills are no match. Photo by Adamantios. Although George's plan might "work," it's ethically questionable, because it deprives the team of important information. Unless they come to the "right" answer, they're headed for trouble. He's also concealing the difference between their perspective and management's. If the team knew about that difference, they might pursue some other course, such as approaching one or more managers privately to have a candid conversation. And if George's ploy is ever uncovered, his relationships with the team members could be irreparably harmed. George infringed the team's "freedom to see and hear what is here" — one of Virginia Satir's Five Freedoms, introduced last time. In my view, that infringement makes his action unethical. Here are the last three of Satir's Five Freedoms, with applications to influencing others. When we try to control another's feelings, we're probably over the line. Shaming others for feeling what they feel — or for feeling at all — is a common way to violate this freedom. Phrases such as "Don't get all in a tizzy about this," or "Relax and hear me out," are indicators (perhaps) of these attempts. Suppressing feelings doesn't eliminate them, but it does distort them, which limits our ability to use them constructively. all in a tizzy about this,"
what they feelpeople can ask for is one way to infringe this freedom. People also try to constrain how others make requests, in what forum, to whom or how often. And we can find instances of retribution for having made requests. Groups that constrain this freedom deny themselves legitimate ways of learning about resource deficits and other organizational problems. Killing the messenger is one way to deter people from taking risks in their own behalf, but we can also do it by imposing a heavy burden of strictly enforced policies. Because problem-solving organizations thrive best when they form partnerships with their people, limiting personal risk-taking harms both the individual and the organization. See "Never, Ever, Kill the Messenger," Point Lookout for November 7, 2001, for more about killing the messenger. 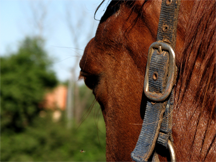 For more about horse vision see Horse Vision Through Your Horse's Eyes at www.horses-and-horse-information.com. Would you like to see your comments posted here? rbrenVDBGKzPRdBydvKYYner@ChacUZZOOhwWqkLhlGeuoCanyon.comSend me your comments by email, or by Web form. The term problem displacement describes situations in which solving one problem creates another. It sometimes leads to incurring technical debt. How? What can we do about it? See also Workplace Politics, Emotions at Work and Ethics at Work for more related articles. I offer email and telephone coaching at both corporate and individual rates. Contact Rick for details at rbrennBNLPYrJVYFkGpQNner@ChacxNHcLVnVtVCSoLLNoCanyon.com or (650) 787-6475, or toll-free in the continental US at (866) 378-5470.